Want to connect with Len? 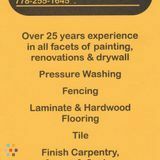 Over 25 years experience in all facets of painting, renovations and drywall. All work comes with 3 year warranty! Mention this ad and/or print the coupon in the picture for and save 10%! Call 778-255-... and ask for Len!